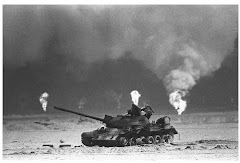 Health of US veterans of 1991 Gulf War: a follow-up survey in 10 years. Kang HK, Li B, Mahan CM, Eisen SA, Engel CC, J Occup Environ Med. 2009 Apr;51(4):401-10. OBJECTIVE: To assess periodically the health status of a cohort of 1991 Gulf War veterans by comparing various health outcomes with those of their military peers who were not deployed to the Gulf. METHODS: We conducted a follow-up health survey to collect health information among population-based samples of 30,000 veterans (15,000 Gulf War veterans and 15,000 Gulf Era veterans) using a structured questionnaire. RESULTS: Gulf veterans reported significantly higher rates of unexplained multi-symptom illness, chronic fatigue syndrome-like illness, posttraumatic stress disorder, functional impairment, health care utilization, a majority of selected physical conditions and all mental disorders queried during the survey than did Gulf Era veteran controls. 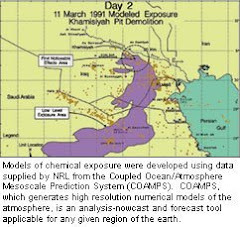 CONCLUSIONS: Fourteen years after deployment, 1991 Gulf War veterans continue to report a higher prevalence of many adverse health outcomes, compared with Gulf Era veterans.